Curlyleaf pondweed is another hardy and incredibly invasive submerged aquatic. It has oblong 2 – 3 inch blue-green leaves that are wavy along the edges, like lasagna. Along the edges of the leaves you will find very small serrated edges. Like Eurasian Watermilfoil, the flower stalks stick above the water’s surface and appear reddish-brown in color. This plant produces small greenish brown pine cone look-a-likes called turions. Curlyleaf pondweed forms dense mats in the water, which die off to create a great deal of waste in bodies of water. This plant has an extensive and dense root system and can tolerate extreme conditions. 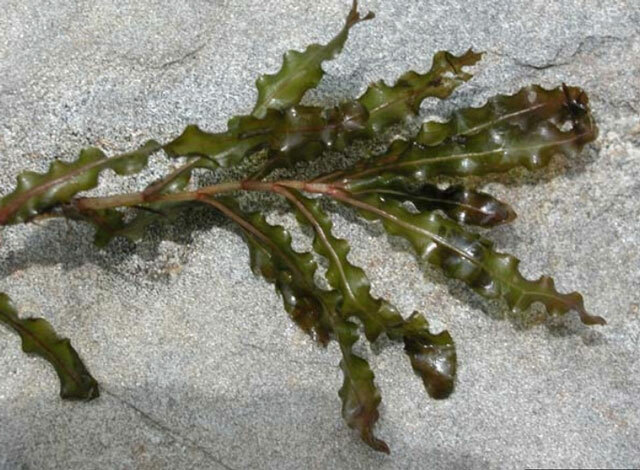 Like many noxious invaders, curlyleaf pondweed is an incredibly adaptive and hardy plant. It can grow in a variety of different locations and sediment types, and it can tolerate extreme conditions including low light and cold water temperatures and has even been found growing under inches of snow and ice. It can grow in deep or shallow waters and prefers soft soils and sediments. It will also grow well in waters that have strong waves or in streams with a moderate stream flow.